Home→Book Launch→050916: Champagne and Cocaine Reading with Richard Vetere and actors Maja Wampuszyc and Ilene Kristen. 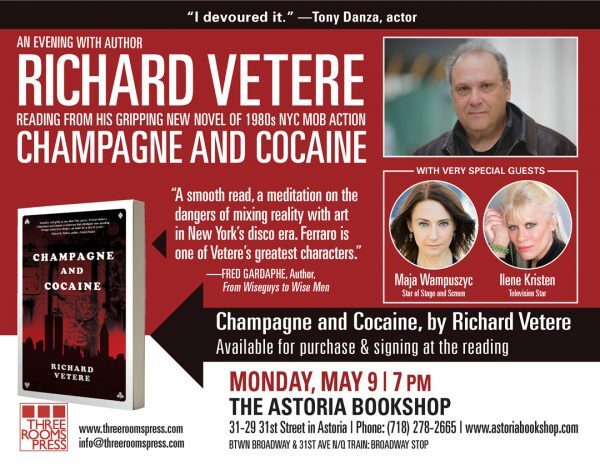 Award-winning New York author RICHARD VETERE celebrates the release of his thrilling new novel CHAMPAGNE AND COCAINE with a reading and signing at Astoria Bookshop on Monday, May 9 at 7 pm. Vetere will be joined by star of stage and screen Maja Wampuszyc and television star Ilene Kristen. The event will feature the author—whose previous books include The Writers Afterlife and The Third Miracle—reading from his new book and sharing stories about what inspired it. A book signing follows the reading.